Cheesy Chicken Tater Tot Casserole with Bacon is a FAST and EASY weeknight dinner, made with tater tots, Alfredo sauce, cheese, bacon, and spices, ready in under 30 minutes! I love quick and easy gluten free casseroles because when I get home from work, I am H-U-N-G-R-Y, and don’t want to wait for a home cooked meal. On nights like these, I also love making Garlic Herb Baked Chicken Drumsticks, Creamy Potato Leek Soup, and Easy One Pot Chicken Parmesan & Pasta! 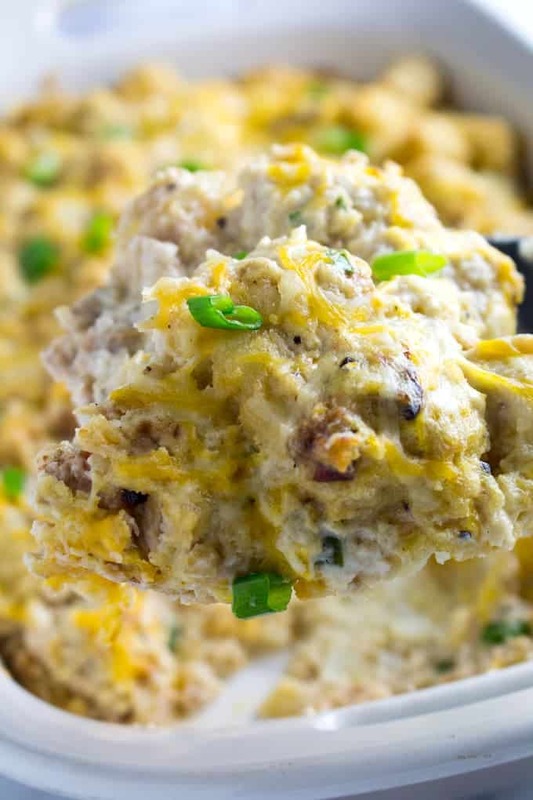 Cheesy Chicken Tater Tot Casserole with Bacon is the ultimate comfort food. It’s unbelievably creamy, filling, and hits every single comforting emotion at the same time. All you need is cooked chicken (leftovers work great here! ), a bag of tater tots, Alfredo sauce, shredded cheese, and some seasoning. That’s it! You can also throw some veggies in here if you want to, like broccoli, carrots, or peas. 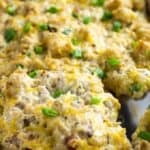 What has to be gluten free for this tater tot casserole recipe? You should double check a few of these ingredients because the store-bought versions can be found either way, to make sure you buy the ones that are gluten free. The tater tots themselves, I usually get a popular brand that lists gluten free on the label. For the Alfredo sauce, there are a few brands you can buy, or you can make your own which is what I do (it’s pretty quick and easy!). 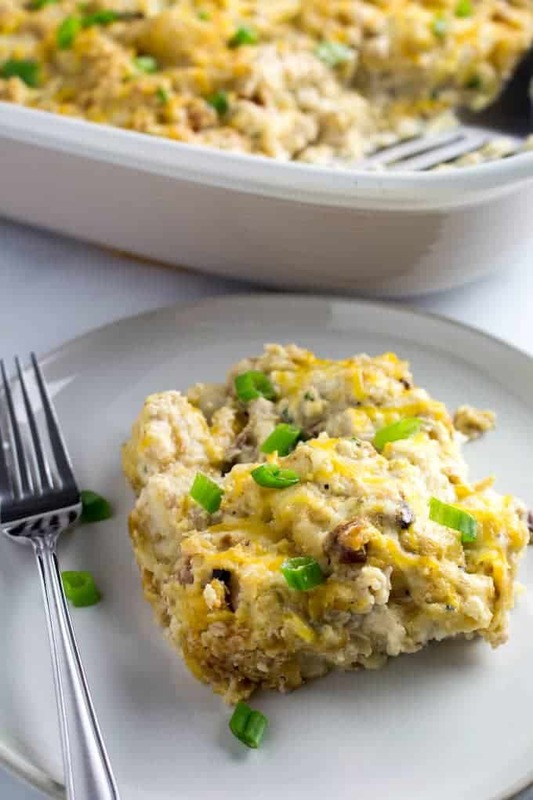 You can also make this with my cream of mushroom soup, but I like to make this tater tot casserole recipe without soup because I think the Alfredo sauce adds a lot of flavor to the dish. And of course, double check any seasoning blends that you have. 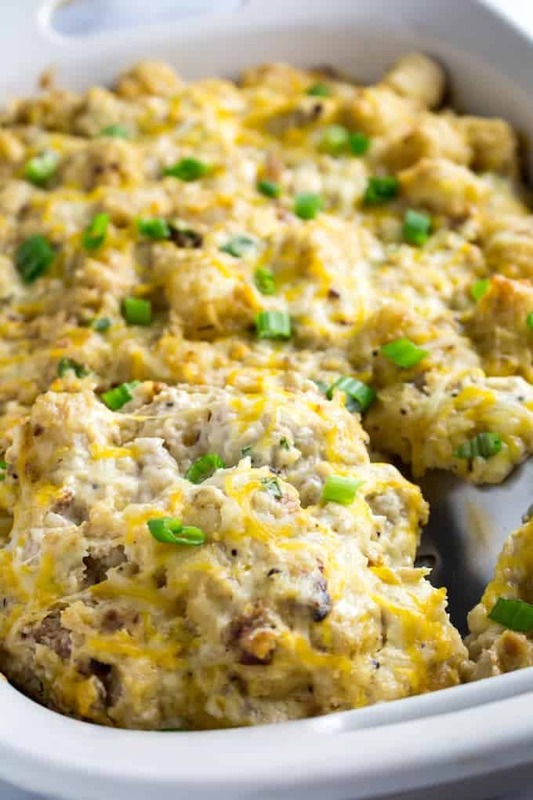 Can you make cheesy chicken tater tot casserole with bacon ahead of time? Yes, you can definitely make this recipe ahead of time! Just layer everything together, wrap your casserole dish tightly with plastic wrap and refrigerate. I probably wouldn’t go more than 24 hours here, because it will turn out soggy. But I’ve made this the night before when I know I’m going to be busy. How long will cheesy chicken tater tot casserole with bacon last? Leftovers will last in the refrigerator for 3-4 days, sealed tightly in an airtight container (or, you know, really, really tight plastic wrap). 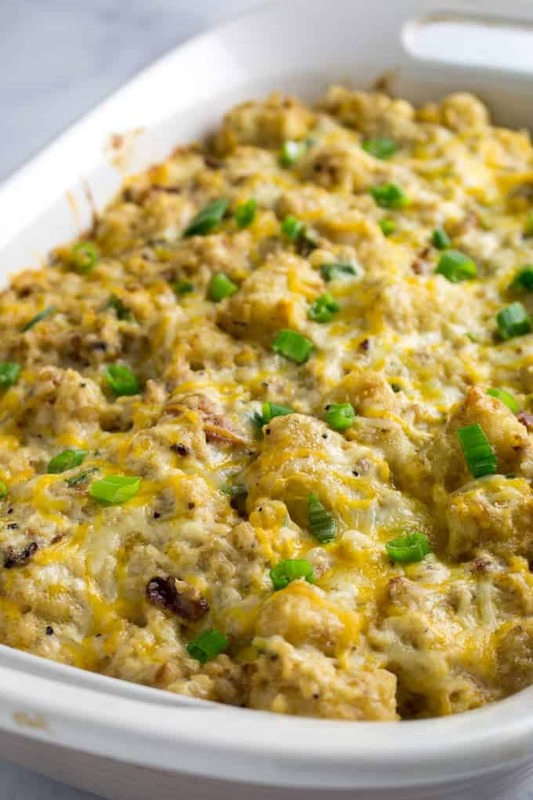 What veggies can we add to cheesy chicken tater tot casserole? 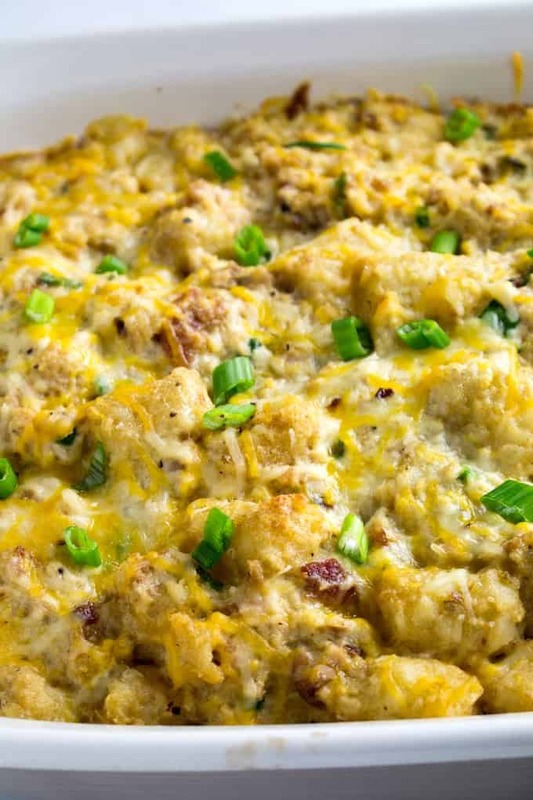 Can you freeze cheesy chicken tater tot casserole with bacon? You can freeze it, but this does contain a dairy-based Alfredo sauce which doesn’t always look pretty when reheated. I would get all of my ingredients together, and freeze the filling to save time. Then when you’re ready to make it, just defrost the night before in the refrigerator, and mix the Alfredo sauce with the filling and throw it in the oven. I like to use real bacon when I make this, because I’m already using potatoes and cheese, so at this point you might as well go all-in on the calories. It’s comfort food, it doesn’t count, right? 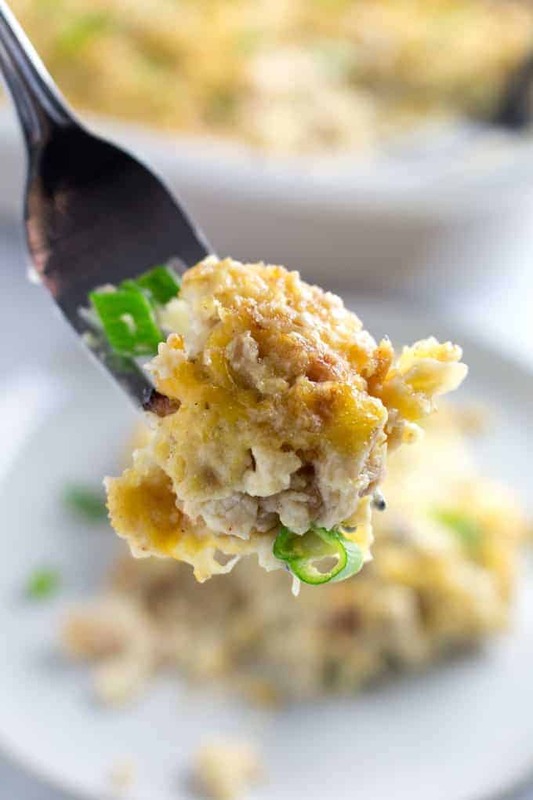 You can make this cheesy tater tot casserole with no meat, just leave the bacon and chicken out of the equation. You can substitute crumbled extra firm tofu for protein. Just press the tofu with paper towels to get as much water out as possible, then crumble it with your hands into the dish at the same time the chicken would have been added in the recipe. If the top of your tater tot casserole isn’t getting golden brown enough, at the very end of the cooking time turn on the broiler for 1-2 minutes. Watch it really closely, because the broiler is really hot and can burn things quickly if you’re not practically standing over it. You can layer your tater tots decoratively in the pan if you want to. I don’t like to do it, because nobody has time for that. I like to top my casseroles with extra green onions or chives, because it makes the casserole look super fancy when I serve it. Preheat oven to 350F. Grease a large baking dish. In a large bowl, whisk together Alfredo sauce and seasoning. Add all other ingredients and stir together. Pour into baking dish and top with remaining cheese. Bake for 20-25 minutes, or until golden brown on top. If your tater tot casserole isn't brown on top, turn on the broiler for 1-2 minutes. Watch closely so it doesn't burn! Dutch Oven Chili Recipe - Gluten Free!